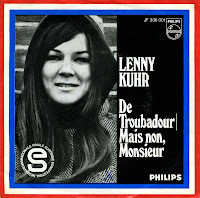 Today is the 40th anniversary of Lenny Kuhr winning the Eurovision Song Contest with 'De Troubadour'. The event took place on March 29, 1969 and the 16 participating countries awarded the exact same 18 points to four competitors, causing four countries to win that year. Since there was no tie-break rule in place, Spain's Salome won with 'Vivo Cantando', Lulu from the United Kingdom won with 'Boom bang-a-bang', France's Frida Boccara won with 'Un jour, un enfant' and Lenny Kuhr won for the Netherlands. According to some, France would have been the overall winner because it was their song that got votes from all but six countries, although Lenny Kuhr was the only participant of the four that got the highest mark from one country: six points. Whatever the real outcome might have been, today is a great day to highlight this song. There is a whole website devoted to the 40th anniversary of 'De Troubadour' here, and if you want to hear the song in German, Spanish, French, English and Italian, go to this page. On this blog you can hear the original song plus its B-side, 'Mais non monsieur'.